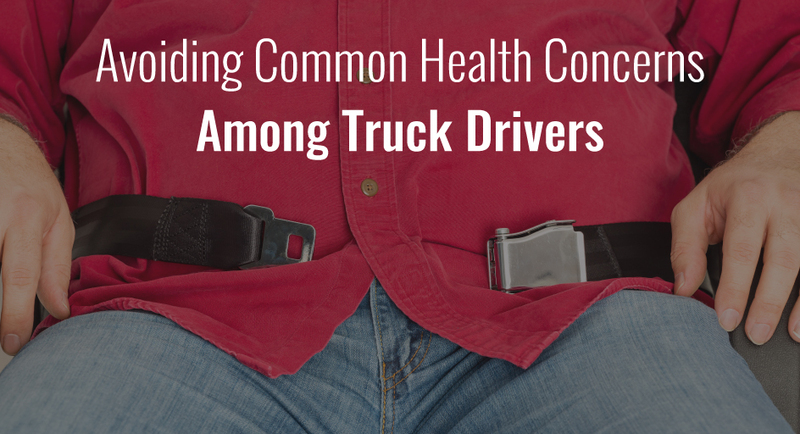 There are various health problems that many truck drivers are at risk of due to the nature of their employment. Of these, the most critical are obesity, stress, fatigue, muscle strains, neck & back injuries, substance abuse, depression and sleep deprivation. Although dangerous, these risks are mostly preventable and certain measures can be taken for truckers in order to avoid these health issues as much as they can. Two common complications for truck drivers are obesity and stress, which result in high blood pressure and diabetes. The culprit is usually the sedentary nature of truckers’ jobs. Drivers should be sure to walk and stretch and move their body when waiting to load or unload. Having a healthy diet can also help to prevent obesity and stress levels. Many drivers will make frequent stops to purchase food, but this is not recommended. Because of the unhealthy nature of almost all fast food chains, it’s recommended to prepare meals in advance when making a long drive. By bringing substantial meals along the way, drivers can avoid the slippery slope of fast food purchases (and it saves time, too). Another problem many drivers face are musculoskeletal injuries due to the harsh nature of loading / unloading and the uncomfortable design of the truck cabs. There are many products on the market which can help to improve posture and can assist in avoiding strain on your neck and back. Respectively, drivers are encouraged to lift only what they know is safe. With all kinds of loading, the golden rule of “Lift with your legs, not your back” always holds true. As mentioned above, performing good, regular stretching is a great way to keep your body from getting stiff on the job. Many truck drivers are also reliant on substances in order to perform their job adequately. For example, many rely on stimulants to stay awake during long stretches of traveling. Unfortunately, these stimulants generally have adverse health effects and should not be used regularly (if ever). Another problem many drivers face is smoking cigarettes, which is a common coping mechanism and leveler. Boredom may also lead to an increase in cigarette smoking since many truck drivers spend their time alone and this simply gives them something to do. To avoid health risks related to substances, just avoid using them. Speak with your trucking company and ask for a change in schedule if you feel your current route is too hard on your body. Many times trucking companies are very open to work with their employees due to the high turnover rate. Another unfortunate illness faced by many truck drivers is depression, caused by isolation on the job. In terms of preventing this, drivers are encouraged to spend the time they do have at home with friends and family, as socializing is a key factor in having good mental health. Another factor affecting this is lack of sleep, which is highly correlated with signs of depression. Studies have shown that poor sleeping habits can be a leading cause in depression. Coupled with the isolation of the job, drivers should certainly be aware of warning signs so that they can seek a medical professional if they feel it is necessary. Also, with the reduction in number of truck stops, drivers can have trouble finding a safe and secure place to sleep and are occasionally forced to sleep on the side of the interstate. In these conditions, sleep may be difficult to come by as drivers do not feel safe and secure with vehicles constantly driving by at 70+ mph. This restless sleep can leave drivers feeling fatigued, resulting in a high number of trucker accidents. In fact, around ⅓ of accidents caused by truckers are due to dozing at the wheel. This number could be significantly reduced if more frequent rest stops were established so that truckers can get the restful sleep that they need.